I'm pretty amazed by these folkloric inspired wooden spoons made by Alisa. Considering that you (or your spouse) own a wood burning tool, all that you need is to let your imagination run wild and those boring wooden utensils of yours can get a whole new life. Oh, and imagine what a perfect gift they make! 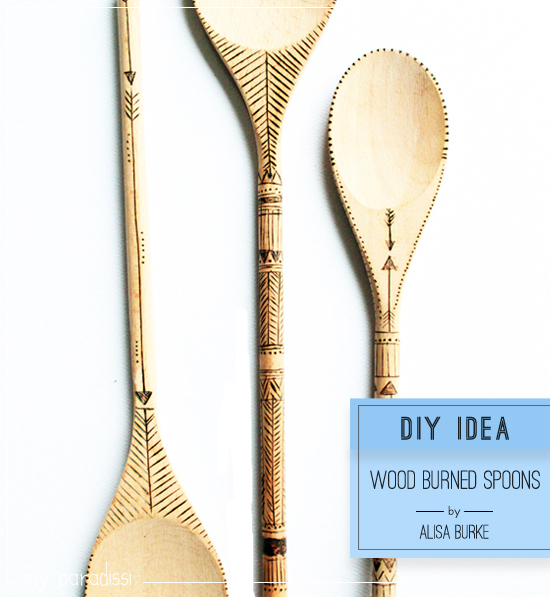 3 comments on "DIY: Wood burned spoons"
Love the pattern and easy to make. I love these. I saw like this in one of the gift store in our place and it does quite cost some bucks. Making a customized one will surely saves me a lot. This is perfect for gifts. I just did this for Christmas gifts and they were well received. I did designs on the front and then wrote their first names on the backs in really neat cursive writing. Onto picture frames now. I wrote the first verse of "You are my sunshine" on a frame to my son and the his name and year. Instead of writing sunshine I drew a sun.